Siting “The impacts of climate change — including an increase in prolonged periods of excessively high temperatures..”. Fast forward to January 2014 and the affects of the Polar Vortex! UPDATE I: More Global warming at Drudge, but f course the Libs say that the global warming is responsible for the cold weather. Of course rational thinking folks on the right know better. For years those who dared question global warming were called crazy and extremists. Hmm … sounds more like the climatologists who spew everything is caused by global warming are sounding a bit crazy these days. 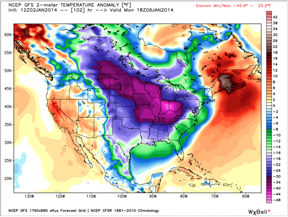 Daily Commentary – Monday, January 6, 2014 – Global Warming as Record Breaking COLD Hits Accross the United States? Yesterday Nemo blasted New York and New Jersey, overnight it set its force upon the Northeast. NEMOGEDDON … The massive snow storm with hurricane-force wind gusts and blizzard conditions has hit the Northeast overnight. Nemo has left more than 650,000 homes and businesses without power and has made many roads impassable as New Englanders are waking up to two and three feet of snow and snow drifts up to six or even feet. Coastal areas are also dealing with potential flooding. There are travel bans in Connecticut Rhode Island and Boston, Massachusetts. Travel bans have also been called for on Long Island, NY. Thousands of flights have been canceled between Logan International in Boston, MA, Bradley International in Hartford, CT, JFK International and LaGuardia in NY and Newark International in NJ. Some have wondered whether this storm could top Boston’s all-time single-storm snowfall record of 27.6 inches, set in 2003. I remember that one very well. More than 38 inches of snow fell in Milford in central Connecticut, and an 82-mph wind gust was recorded in nearby Westport. 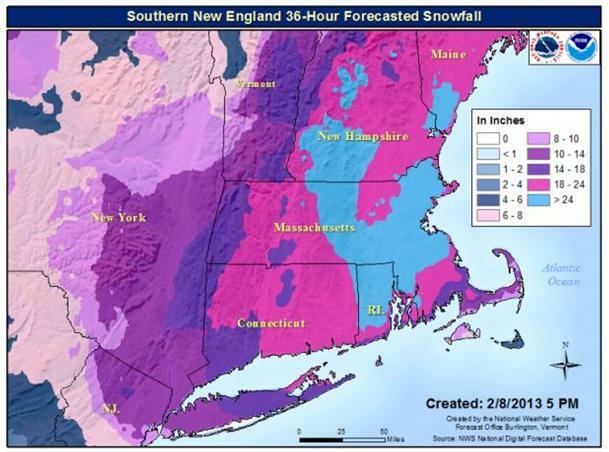 Areas of southeastern Massachusetts, Rhode Island and New Hampshire notched at least 2 feet – with more falling. Airlines scratched more than 5,300 flights through Saturday, and the three major airports serving New York City as well as Boston’s Logan Airport closed. Flooding was also a concern along the coast, and the possibility led to the evacuation of two neighborhoods in Quincy, Mass., said Fire Deputy Gary Smith. But it did not appear to create major problems in New York and New Jersey, states hit hardest during last October’s Superstorm Sandy. Near record snow falls hit Boston, MA and it’s still snowing. As of 7 a.m., Boston’s official snow total was 21.8”. This would rank as the 6th highest snowstorm in Boston’s recorded history (well over 100 years). With an additional 3-6” possible Saturday morning we could very easily approach the all-time snowfall record of 27.5” set back in the President’s Day storm of 2003. A 74-year-old man in Poughkeepsie, N.Y., died after he was struck by a car on a snowy street. The driver, 18, said she lost control of the car due to the snow. One pedestrian was struck by a vehicle and killed Friday night in Prospect, Conn., state police spokesman Lt. J. Paul Vance said. In southern Ontario, an 80-year-old woman collapsed while shoveling her driveway and two men were killed in car crashes. Portland recorded a record snowfall for a single storm as snow and wind continued to batter the city and most of southern and central Maine. The National Weather Service in Gray reports the city had received 29.3 inches of snow at the jetport by 8 a.m. The previous record of 27.1 inches was recorded in Portland on Jan. 17 and 19, 1979. Other snow totals as of 8 a.m. include: 28 inches in south Windham; 23.5 inches in Lewiston; 26.1 inches in Gorham; and 26 inches in Kennebunk, according to the weather service. 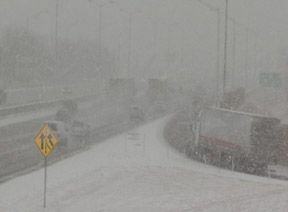 “Right now we’re seeing significant snowfall occurring along the coast from Augusta down through the Portland area. This will continue for a couple hours before it starts to weaken and move east,” Chris Legro of the National Weather Service in Gray said shortly after 6 a.m.
Legro said 24.7 inches of snow had fallen in Kennebunk by 6 a.m. Portand had 12.3 inches by 12:30 a.m. Portland is experiencing wind gusts of around 50 mph and visibility of less than a quarter-mile. 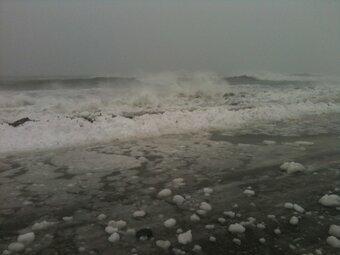 UPDATE III: NEW HAMPSHIRE - Nemo pounds the Granite state and the seas are pounding the NH shoreline. 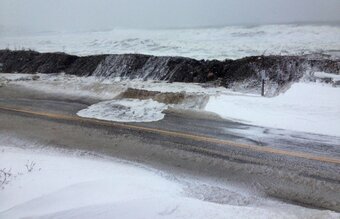 The state of NH at 10:15 a.m. today closed Route 1A (Ocean Boulevard) from the Hampton town line to the Rye town line. A state of emergency has been declared in NH. The waves are crashing over the sea walls in Rye, NH. Thus the reason why Rt. 1A has been closed to all traffic, except emergency vehicles. 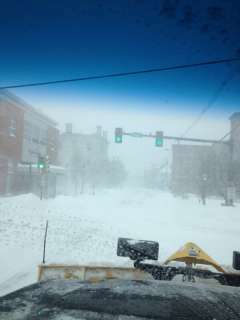 Downtown Portsmouth, NH looks quite different this morning than a usual Saturday morning. UPDATE IV: CONNECTICUT - The state of Connecticut has been basically paralyzed by winter storm Nemo. Parts of the state have been fit with 2 feet of snow, others areas up to 3 feet. There have been two Storm-Related deaths reported; roads are closed across Connecticut as snowfall totals near 3 feet in some towns. Connecticut residents woke to a world of white on Saturday after a blizzard dumped up to 3 feet of snow across southern New England, burying abandoned cars, stranding travelers and leaving roads impassable. Two storm-related deaths have been reported. An 88-year-old woman who was using a snowblower in Prospect was struck by a car that didn’t stop, Gov. Dannel P. Malloy said during an 11 a.m. press briefing. And in Danbury, a 73-year-old man died Saturday morning after being found in his driveway, police said. The governor said the travel ban he put in place at 5 a.m. will continue until further notice. Hartford, CT has been completely shut down following Nemo. There has been a vehicle ban on all cars except for emergency vehicles. UPDATE V: U.S. Postal Service suspends mail delivery in New England due to blizzard … Post offices in Maine, Vermont, New Hampshire, Massachusetts, Connecticut and Rhode Island will remain closed Saturday.